What a great choice for the beginning of the summer. Interesting discussion with your students. I love the theme of friends helping each other and coping when you get scared. Excellent activities. I love how these science topics are made so much fun with these two characters. I remember the first time I heard about the concrete boat challenge, and even as an adult I had to stop and think about it! The friendship element is a great one for re-readability. Thanks for sharing this one! Sounds like a fantastic book that covers intellectual and emotional knowledge. Love it! Fun video. Hope I can get the book through the library. 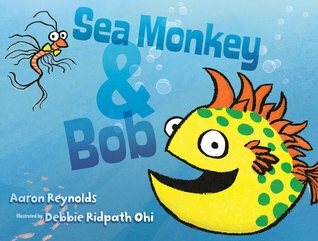 Sea Monkey & Bob is a funny story. Reading it made me think of the large cruise liners I have been on, always wondering how they stay moving forward and not sinking from all its weight. Kids will like these two characters. Great review, Andrea. Put the book on hold. I am very curious about it. Thank you. Thank you so much for this thoughtful post about SEA MONKEY & BOB, Andrea! Lovely review. Great storyline and beautiful illustrations. I loved the video. Oh this sounds wonderful~ thanks for the info and the recommendation!